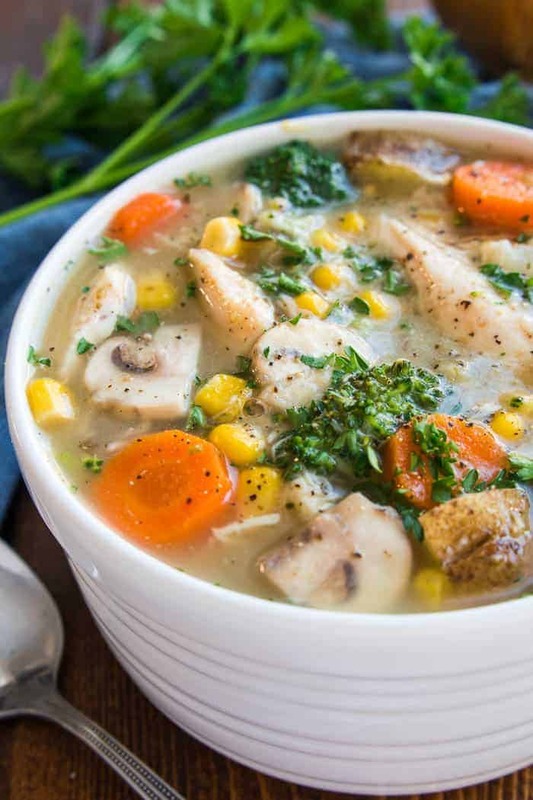 Warm up this winter with a big bowl of Chicken Vegetable Soup! 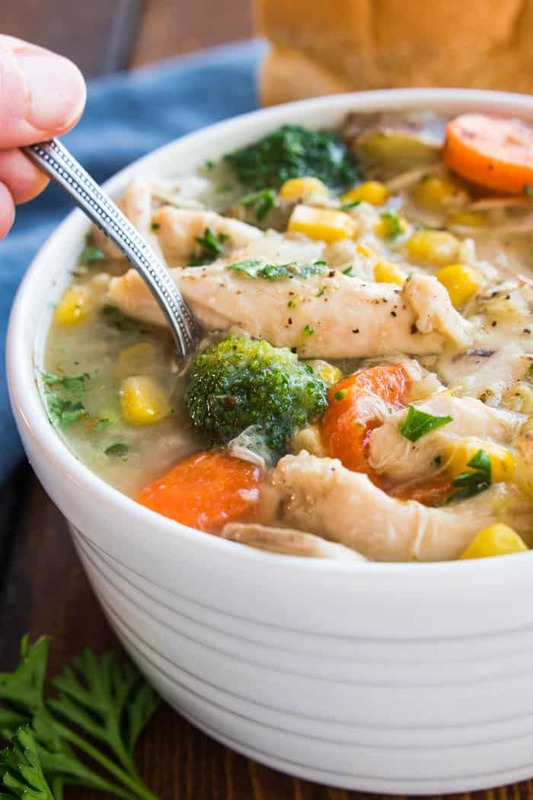 Loaded with chicken, broccoli, potatoes, carrots, mushrooms, and corn, this chicken soup is hearty, satisfying, and so delicious. 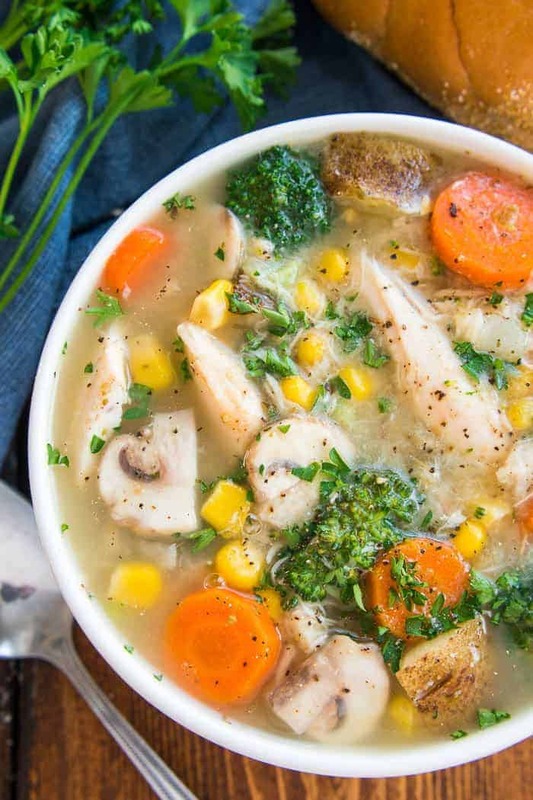 The perfect alternative to chicken noodle, this Chicken Vegetable Soup is literally packed with veggies and full of flavor. If you’re looking for a dinner option your whole family can agree on, look no further. This soup is it! Best of all, it’s ready in 30 minutes or less, which makes it an ideal option for busy weeknights or lazy weekend days. Our family loves trying new soup recipes, and this Chicken Vegetable Soup is definitely one worth trying….and making again and again! HOW DO YOU MAKE THE BEST CHICKEN VEGETABLE SOUP? Choose your vegetables. I used a combination of potatoes, broccoli, carrots, mushrooms, and corn…but you can feel free to switch things up according to your family’s tastes. Choose your chicken. For this recipe I used 1 rotisserie chicken, which came out to about 3 cups of meat. Any type of cooked chicken would work well….and if your family doesn’t like chicken? Italian sausage would also work well in this recipe. Choose your thickness. We love a hearty soup that’s packed with delicious ingredients, but if you prefer more broth, feel free to decrease the amounts of vegetables and/or chicken OR simply add more broth. Avoid mushy vegetables. The best way to do this is to pre-chop all your veggies so they are ready to go into the soup at the same time. Once they’ve reached a point of tenderness, remove the soup from the heat and it’s ready to serve! Make it creamy if you choose. This soup has a small amount of creaminess from the cream of mushroom soup, but you can feel free to add more by using heavy cream, half and half, or even sour cream. A bit of shredded cheese would also make a nice addition! So. Has the cold weather set in where you live? Here in Wisconsin it’s been in the single digits for DAYS. Or maybe for weeks. To be honest, I’ve stopped keeping track. All I know is that it’s COLD out there….and I am choosing to leave my house as little as possible. These days, my outings mainly consist of trips to the grocery store. Because even when it’s cold, we still have to eat. But other than that? It’s been a while since I’ve chosen to set foot outside. Of course, there are pros and cons to this type of decision. Pro? I stay warm. Con? I rarely see other people….except at the grocery store. Clearly I won’t be able to maintain this forever. But for now, it’s working. I’m spending my days in comfy clothes, sitting in front of the fireplace, bundling up in blankets….and….eating lots of soup! Seriously. Is there any better food to warm up with than a delicious bowl of soup? I think not. And of course I have my favorites, like French Onion Noodle Soup and Quinoa Taco Soup and Pasta e Fagioli …(all of which you need to add to your list! )…but that doesn’t mean I’m not ALWAYS open to new suggestions. My latest favorite? This Chicken Vegetable Soup, made with broccoli, potatoes, mushrooms, carrots, corn, and rotisserie chicken. I LOVE using rotisserie chicken in soups because it adds the best flavor and makes them so incredibly easy. This Chicken Vegetable Soup is ready in under 30 minutes, which means it’s not only delicious, but also totally practical. We all know that weeknights can get crazy…..and if you’re anything like me, you’re constantly on the lookout for new EASY dinner ideas. Especially ones your kids will actually eat! Well, my whole family loved this chicken soup recipe. In fact, they devoured it! Which always feels like win at the end of a long day. I hope you love this Chicken Vegetable Soup as much as we do! Warm up this winter with a big bowl of Chicken Vegetable Soup! 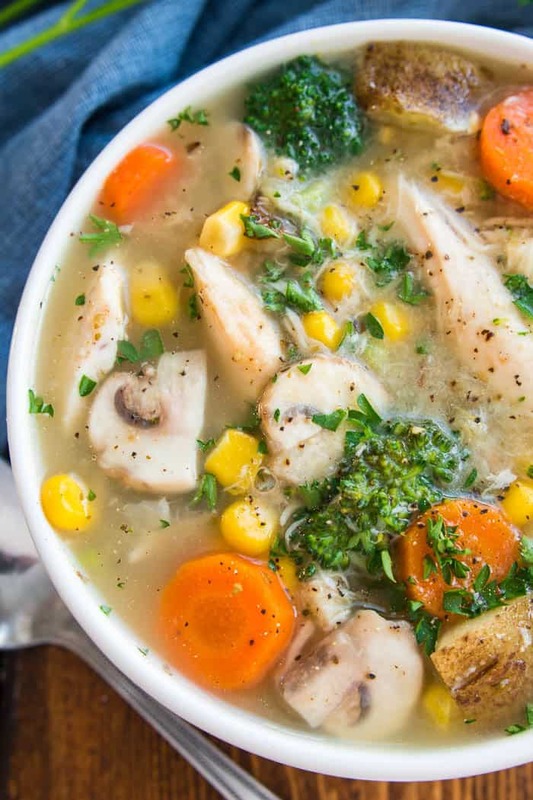 Loaded with chicken, broccoli, potatoes, carrots, mushrooms, and corn, this soup is hearty, satisfying, and so delicious. 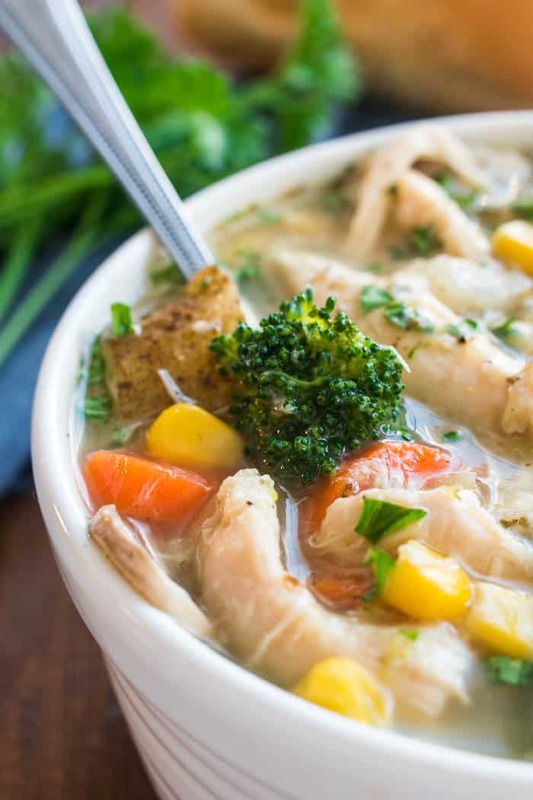 The perfect alternative to chicken noodle, this Chicken Vegetable Soup is literally packed with veggies and full of flavor. If you're looking for a dinner option your whole family can agree on, look no further. This soup is it! Best of all, it's ready in 30 minutes or less, which makes it an ideal option for busy weeknights or lazy weekend days. Our family loves trying new soup recipes, and this is definitely one worth trying....and making again and again! In a large saucepan, combine cream of celery soup and chicken broth. Heat to boiling. Add potatoes; boil 5 minutes. Add remaining ingredients. Reduce heat to low; cover and simmer 10 minutes or until vegetables are tender. This is definitely a weekend for warm and comforting soups! This looks wonderful! It’s like almost half the country could use a warming and comforting dish like this! I’m lucky to be in the warm part of the country. I can’t wait to try this tasty-looking soup! Stay warm! This is fully loaded with everything we love! Such a great idea to use rotisserie chicken. This soup looks like a seriously bowl of comfort! This looks so warm and delicious. It is cold here in coastal Virginia . I would love to make it this week. I have one question and it is about the sodium content. It has a very high sodium content , is there a way to decrease this? I always try to keep sodium low as much as possible in most foods I eat. I know most soups have a high one. Stay warm and I appreciate the recipes. I made my own cream of celery soup and my own chicken broth… Both of which decrease the sodium content significantly. You can also. Use lower sodium organic chicken broth in the cartons. I will have to try this soup out very soon! Looks so good! Wow this looks so delicious and hearty! Can’t wait to try it in this cold weather! What type of seasoning is Old Bay seasoning? By any chance, do you know how many weight watchers points this is? I made this with sweet potatoes instead of regular potatoes and garnished with crushed tortilla chips, shredded cheese and sour cream. Oh my how delicious! This is my new favorite soup! I add stewed tomatoes, a can of rotels and some spicy V8. No broccoli. And no cream of anything.